A lunar panorama shows Geologist-Astronaut Harrison H. Schmitt working at the Lunar Roving Vehicle during the second Apollo 17 extravehicular activity on Dec. 12, 1972. 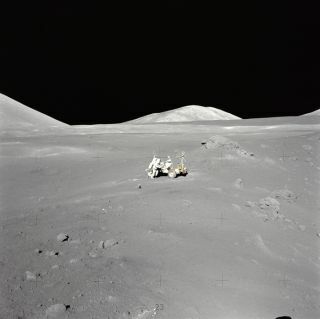 In this historical photo from the U.S. space agency, an extraordinary lunar panorama at Station 4 (Shorty Crater) showing Geologist-Astronaut Harrison H. Schmitt working at the Lunar Roving Vehicle (LRV) during the second Apollo 17 extravehicular activity (EVA-2) at the Taurus-Littrow landing site. This is the area where Schmitt first spotted the orange soil. Shorty Crater is to the right. The peak in the center background is Family Mountain. A portion of South Massif is on the horizon at the left edge.